It may come as a surprise that our modern day Kooragang Island is a creation of industry. Prior to the 1950s the Hunter Estuary was home to many islands. 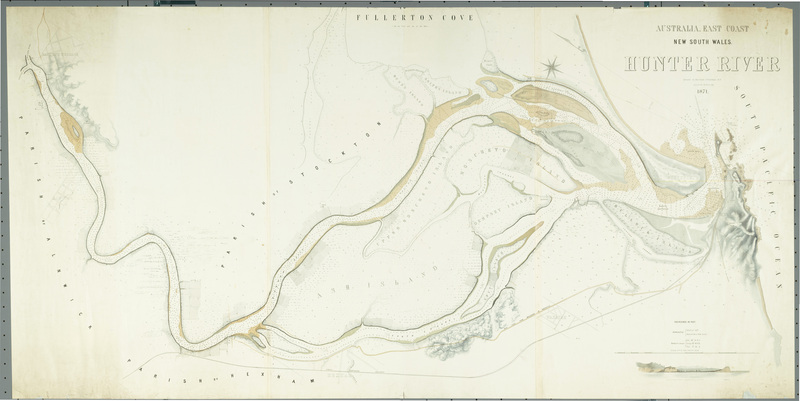 It is a map of the Hunter River from the township of Raymond Terrace to Newcastle showing cultivation, vegetation, coal piers, inn, saltworks, oyster bank and Walleroo Copper Co. smelting works. Relief shown by bathymetric soundings and hachures. Starting at Raymond Terrace, then on to Kinross, along the Parish of Alnwick, as the Hunter River splits into the North Arm (known as the Hexham Reach, then along past Tomago to Windeyer Reach along the Parish of Stockton, and the South Channel along the the Parish of Hexham. To the north in the Parish of Stockton lie Cabbage Tree and Forest Swamp, Fullerton Cove, Dunn’s Island, Wallis Island, Smith’s Island, Sandy island, Mangrove Island. In between the two arms of the Hunter River emerge Ash Island, Upper Moscheto, Moscheto Island, separated by Moscheto Channel, Dempsey Island, separated by Dempsey Channel, through to Spit Island (with the unmarked Platt’s Channel). The “ancient road to the interior” the Maitland Road is shown as a straight line to Newcastle past the township of Waratah with Railway line. As we approach the North Harbour of Newcastle can be found the Spectacle Islands and Bullock Island lying adjacent to Throsby Creek, before we make out way to The Horseshoe (later to become Horseshoe Beach?) and the Oyster Bank. All of the islands were industrially “glued” together with slag and other industrial pollutants and refuse as a convenient dumping ground to create our modern day Kooragang Island. As the backbone of the Australian Industrial establishment arrived in the form of B.H.P. and its companion industries, they transformed what was then seen as useless swamp lands along the south arm of the Hunter River, into Industrial heartlands. The river and islands were re-designed, modified and sculptured by engineers to enable it to function as an industrial port.